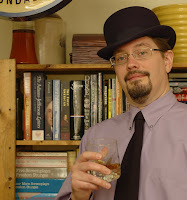 Tomorrow morning I leave for New Orleans and my first Tales of the Cocktail! 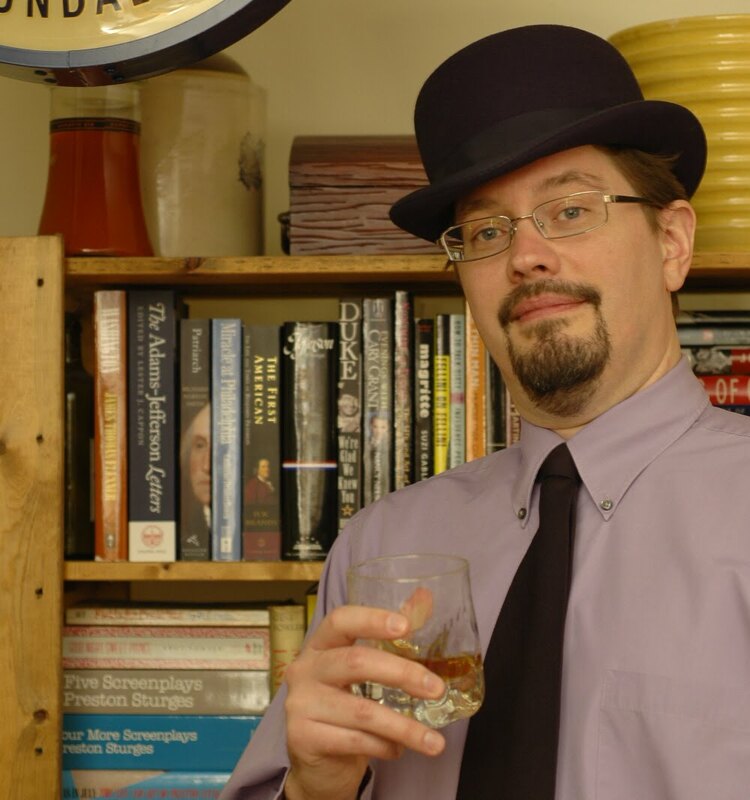 As I've mentioned previously, I'm moderating a "Hollywood Cocktails" seminar with co-presenters Cheryl Charming, Ted Haigh, and Alan Leonhard. We received word that the presentation is sold out, so I'll be speaking before 200 people. All I can say is "Humana, humana, humana... 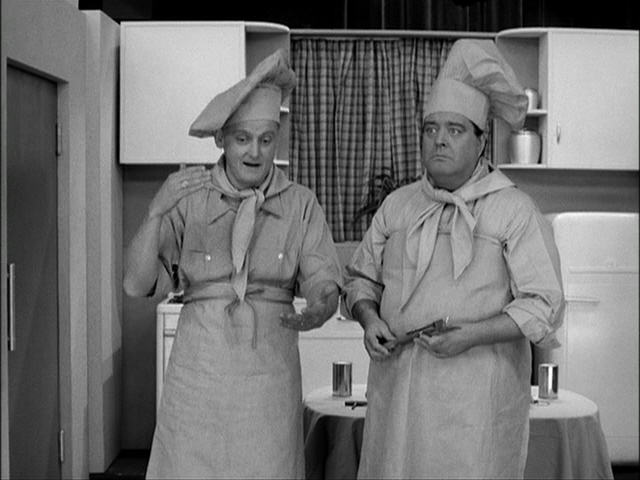 Chef of the Future!" I'll be back next week (likely with a few photos from Tales), and also with a review of Wayne Ewing's newest Hunter S. Thompson documentary, Animals, Whores, and Dialogue: Breakfast with Hunter Vol. 2. In the meantime, wish me luck. 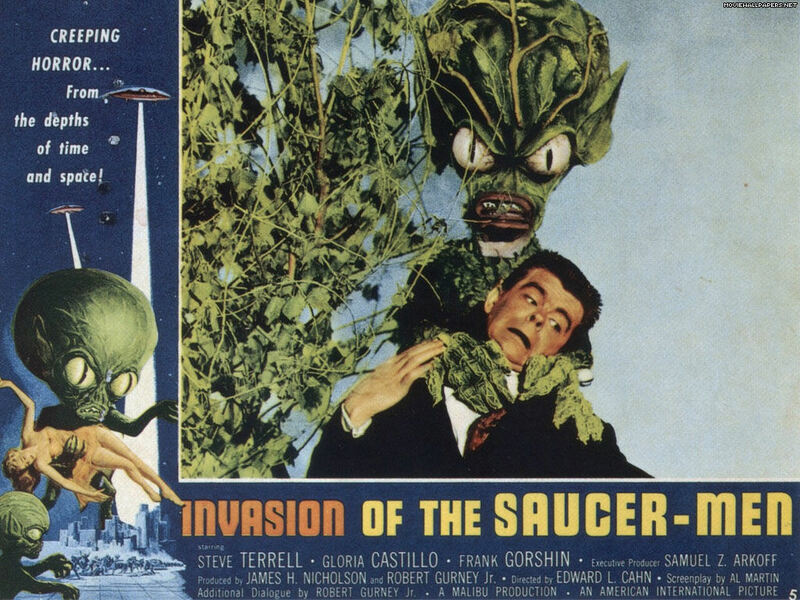 In what purports itself to be a “true story of a flying saucer,” an alien craft lands in the small town of Hicksburg (the first groaner joke of the movie), which leads to a memorable night for a young couple, the military, a promoter looking for easy money, a farmer, and a drunken bull. The couple (Carter and Hayden) are driving back from “Lover’s Point” with their headlights off, to slip past the angry farmer who owns the land, when their car hits something. That “something” turns out to be the body of a bulbous-headed alien. While the couple see the body as an unspeakable horror, Joe Gruin (Frank “the Riddler” Gorshin), a whiskey-slugging con man, sees the extraterrestrial corpse as his ticket to easy street. 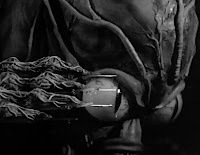 However, before Joe can put the body on ice, the remaining Saucer Men attack the hooched-up huckster with needle-like nails that inject pure alcohol. 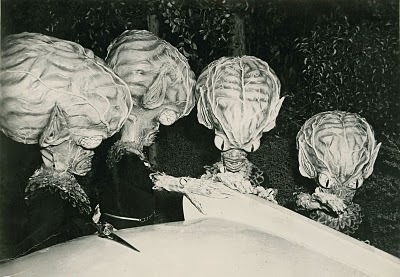 Joe’s heart gives out, and the aliens make it look like the kids hit the overdosed alky with their car. It’s up to the young lovers to clear their name and take out the extraterrestrial menace (with a little help from a beer-loving bull). 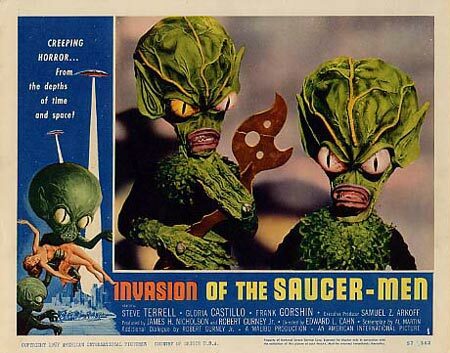 It’s hard to defend Invasion of the Saucer Men. The writing is subpar, the production values are shoddy, and the performances (with the exception of those of Gorshin and Osborn) are mediocre at best. It’s simply a bad movie-- typical of the teen-oriented cheapies that American International Pictures cranked out in the 50’s and 60’s. Yet, Invasion of the Saucer Men is an enjoyable time waster. Everyone involved seemed to understand that they were making a bad film, and the film has a lighthearted, jokey atmosphere that makes it more engaging than many better-made 50’s sci-fi flicks. 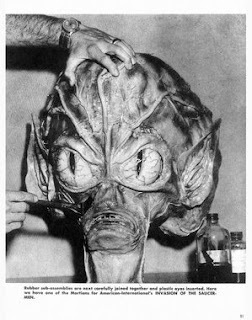 While Paul Blaisdell’s alien costume designs are the most significant aspect of Invasion of the Saucer Men, the film itself contains plenty of pleasures for both fans of cheesy, low-budget fare and soused cinema enthusiasts. 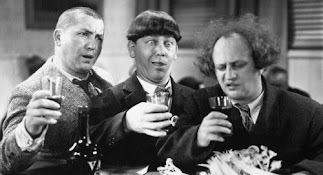 Of course, your enjoyment of the film may be improved by knocking a few back yourself. Potent Quotables--ARTIE: Wow, whatta buzz I got on. Is this some kind of a gag? JOHNNY: Just like his roommate. Do ya get it, Joan? Acute alcoholism. These monsters kill their victims by sticking them with alcohol--pure alcohol! 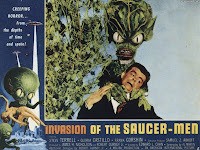 Video Availability--Invasion of the Saucer Men has not been released on DVD in the U.S. However, if you own a region-free player, you can watch the PAL DVD that is available from Australia. An out-of-print VHS (Sony) was also previously released. Similarly Sauced Cinema--If you think this film is bad, get a load of the color remake, The Eye Creatures (1965, a.k.a. Attack of the The Eye Creatures (sic)). Booze News: Sequel to BREAKFAST WITH HUNTER available July 13th! The late, great Hunter S. Thompson would have been 73 on this upcoming July 18th, and this year his fans have a special reason to celebrate. 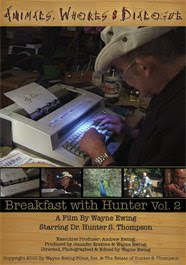 Wayne Ewing, Hunter's trusted friend and video biographer, is releasing a sequel to his acclaimed documentary Breakfast with Hunter just in time for Dr. Gonzo's birthday. While I haven't yet seen Wayne's new film, I've reviewed his previous HST documentaries, Breakfast with Hunter (2003), When I Die (2005), and Free Lisl: Fear & Loathing in Denver (2006), for "Booze Movies;" and I can recommend them all without reservation. Forget other Hunter S. Thompson documentaries. If you want to dive beneath the gonzo persona and experience the real man, Wayne's films are the only ones to see. To receive Wayne's new film--Animals, Whores, and Dialogue: Breakfast with Hunter Vol. 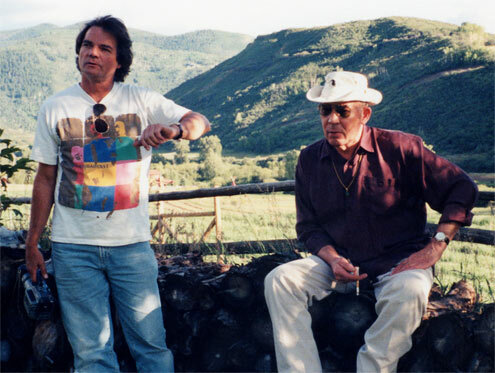 2--in time for a HST birthday viewing, go to the director's Website and place your order today! There's also a discount deal available if you pick up all four of Wayne's HST docs at once. You can view a video snippet of the new film on Wayne's site, but trust me, all of the director's HST films are worth a blind buy!